Tier One Sports will put T1-Neos-3 and experimental co-polyester string into production beginning 2017. Tier One Sports releases T1-NEOS-1, an experimental co-polyester string. Tier One Sports rolls out their T1 Firewire string and Tru Tack overgrips in BLACK. Tier One Sports has partnered yet another year with USTA Florida to provide their members with amazing string discounts. Stay tuned for this exlusive USTA discount in your next USTA Florida email. Tier One Sports has partnered with USTA Florida to provide their members with amazing string discounts until the end of August 2013. Tier One Sports is happy to announce an expansion to the Caribbean Island of Barbados. Tier One Sports has partnered with USTA Northern to provide their members with amazing string discounts from June 5th, 2013 - June 30th, 2013. Tier One Sports has partnered with USTA Northern California to provide their members with amazing string discounts from June 10th, 2013 - June 30th, 2013. 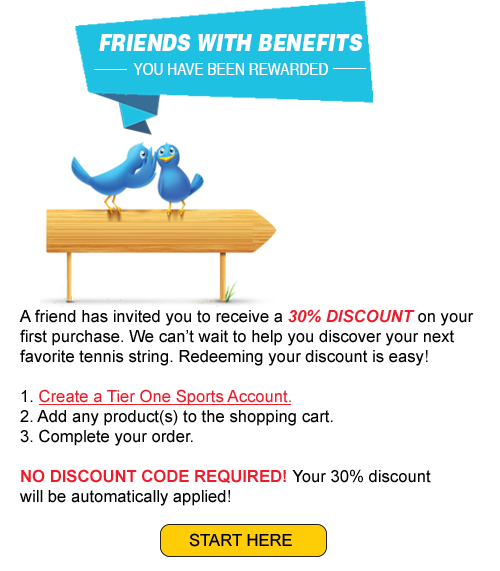 Tier One Sports has partnered with USTA Middle States to provide their members with amazing string discounts through their social media outlets from June 15th, 2013 - June 30th, 2013. As a Southern California based tennis string company, we have the advantage of having one of the largest tennis tournaments, the BNP Paribas Open at Indian Wells, right in front of our door step. If you are lucky enough to take a trip to the tournament, be on the lookout for our 50% OFF discount flyers! Tier One Sports has partnered with USTA Southern California to provide their members with amazing string discounts through the end of April 2013. Tier One Sports is happy to announce their expansion into the Japanese market. Tier One Sports designs and manufactures innovates tennis strings for the recreational to the high performance athlete all at affordable prices! Copyright © 2017 Tier One Sports, Inc. All rights reserved.